Funter Bay resident Gordon Harrison sent me some additional photos of the mystery engine at the cannery. He has marked it with a steel pipe and buoy so it’s more visible to boaters, being located close to the dock it’s something of a hazard to navigation. Looking closely, it seems there are two cylinders and maybe two valve chests (one on each end). 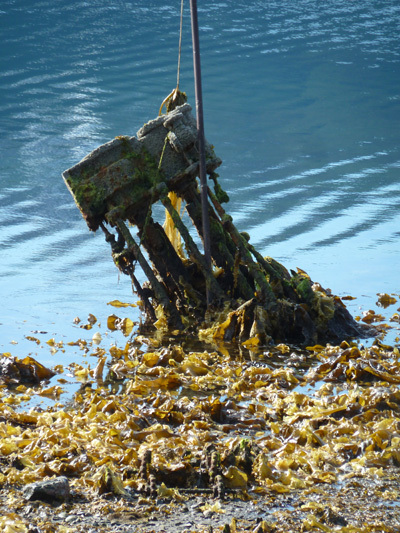 There also seems to be a round flywheel and rectangular tank at the base of the engine, with a pipe leading to the tank, although it’s hard to tell what’s metal and what’s rock under all the kelp and barnacles! If anyone happens to recognize the specific type, model, or even just approximate age of this engine, I would love to hear about it! John Taubeneck reports that it looks like a “Fore & Aft” compound design. As mentioned, I’m not sure if the engine reached its current home via a sunken boat at the cannery wharf, or if it was used or stored on the wharf and fell through as the structure rotted. 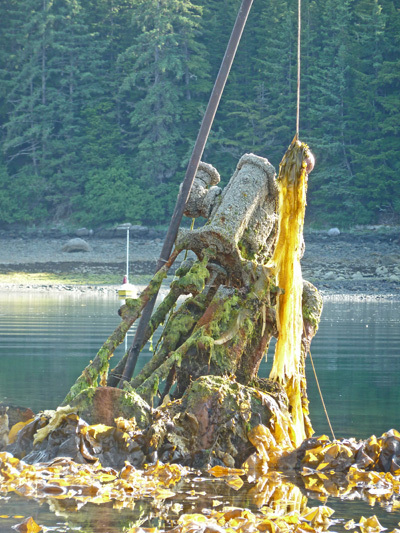 Aside from potential salvage, there was another reason that engines and other equipment were sometimes moved around: Even if obsolete for propulsion, a big chunk of cast iron makes a nice anchor for a mooring buoy! Someone could tie a raft of logs to part of a wreck, float if off at high tide, and then drop it where they wanted to moor their boat. Various things around the bay probably are or were tied to rusty engines on the bottom. Maybe this one was in transit and got left where it now sits? (From Rankin Kennedy, Modern Engines, Vol V via Wikimedia commons). On a side note, in the background of the 2nd picture above, you can see the small yellow sailboat that my sister used to have (now owned by Del Carnes), I had previously put some photos of it on my project page. 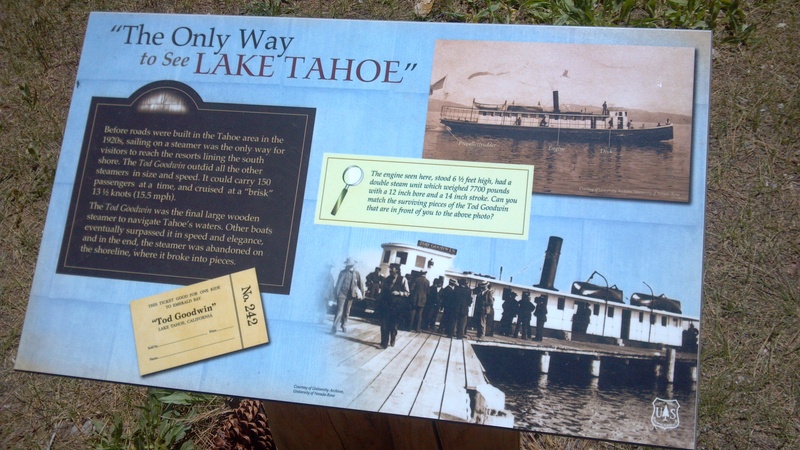 Coincidentally, I happened to be in the Lake Tahoe area last week, and stopped at the Tallac Historic Site. 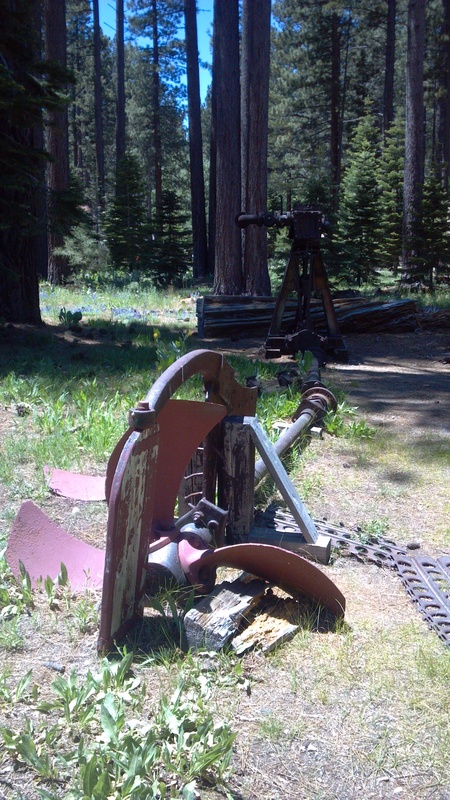 They happened to have a compound engine from a local steam boat, laid out on display with drive shaft and propeller. 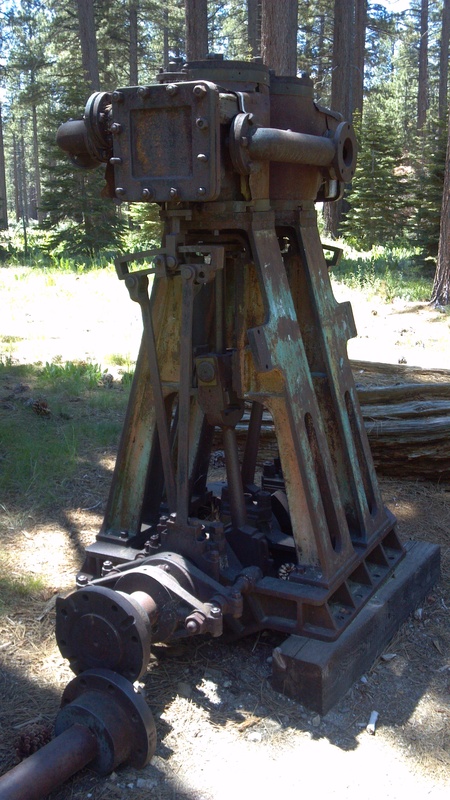 The valve chests and support frame look a little different, but this shows how such an engine would have been set up. 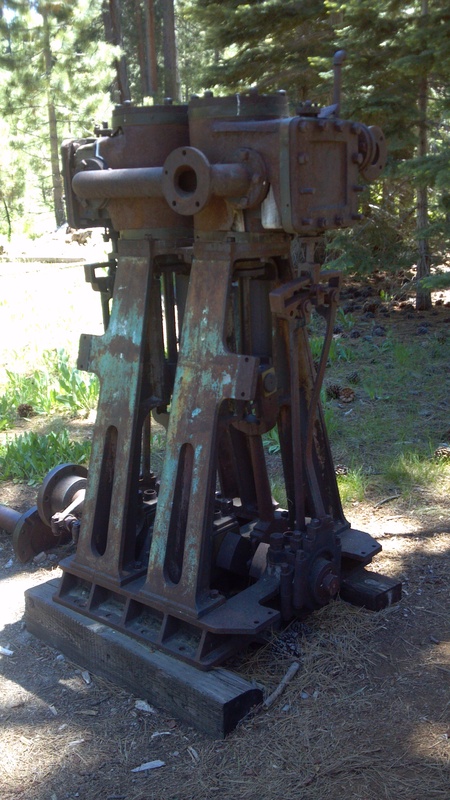 This engine and drive train came from the steamer Tod Goodwin, which operated on Lake Tahoe from 1884 to 1898. More information is available in this book. This entry was posted on Thursday, June 27th, 2013 at 8:49 pm and is filed under Funter Bay History. You can follow any responses to this entry through the RSS 2.0 feed. You can leave a response, or trackback from your own site.